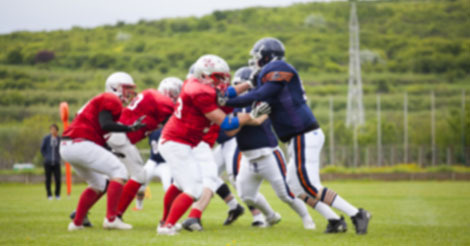 In response to concerns over head trauma in football, numerous changes have been adopted or considered to make the sport safer. Helmet companies continue to try to develop helmets that decrease head impact. Rules changes about blows to the head have been implemented. And limiting or even eliminating contact during practices and transitioning to non-contact football practice has been proposed at multiple levels. I have discussed some of the rules changes and recent helmet technology in other posts. The last suggestion is worth exploring. Would limiting tackling and other contact during some or all of the practices during the week reduce the cumulative number and severity of the blows to the head of football players? A new study published online in the American Journal of Sports Medicine looked at the frequency and magnitude of head impact among 42 high school football players over the course of a 15-week season. Steven P. Broglio, PhD, ATC and other researchers at the University of Michigan compared the number and severity of head impacts of players at different positions during games, contact practices, and noncontact practices. • Over the course of the season, the 42 players sustained 32,510 head impacts. Overall, each player averaged 774 impacts over the course of the season, or approximately 50 per week. • Linemen sustained the most head impacts during the season (average of 1076 per player). Players in the tight end/running back/linebacker group or next (average of 779), followed by players in the wide receiver/cornerback/safety group (417), and quarterbacks (356). • When grouped by session type, head impacts occurred most frequently in games, followed by contact practices, and finally noncontact practices. • The magnitude of head impacts was greater in games than practices. Contact practices were associated with greater magnitude of head impact than noncontact practices. Using this data, the authors estimated that teams cutting back to only one contact practice per week would decrease head impacts 17.8%. Eliminating all contact in practice would reduce the number of head impacts by 38.9%. Should high schools switch to non-contact football practice? While making all practices noncontact would decrease the number of head impacts, it is hard to know the true effect on long-term brain trauma that change would have. There is some data about the cumulative effects on repetitive subconcussive blows, but much more research is needed. The fact that the magnitude of the head impacts was higher during games is not surprising given the intensity of competition. Would reducing contact in practice affect head injuries during games? Would players’ tackling technique suffer without contact in practice? Would players hit even harder during games? Answers to those questions are unclear. I don’t know if this study makes a compelling case for non-contact football practice. More research into brain trauma suffered by players who engage in contact practices versus noncontact ones is needed. 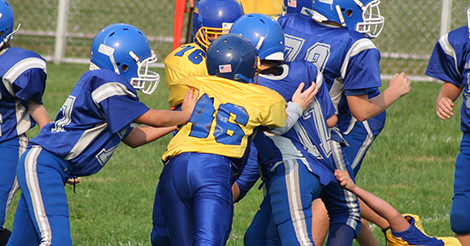 Since it is believed that the brains of young athletes might be more susceptible to injury from head impact, making these changes at the youth football level might be appropriate. Broglio SP, Martini D, Kasper L, Eckner JT, Kutcher JS. Estimation of Head Impact Exposure in High School Football: Implications for Regulating Contact Practices. American Journal of Sports Medicine. Published online ahead of print September 3, 2013.